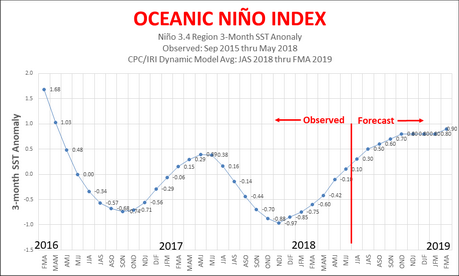 With the eastern tropical Pacific warming and most forecasts leaning toward at least a weak El Niño event this coming winter I have put together a new climatology looking at early-August conditions relative to the subsequent rainfall season. 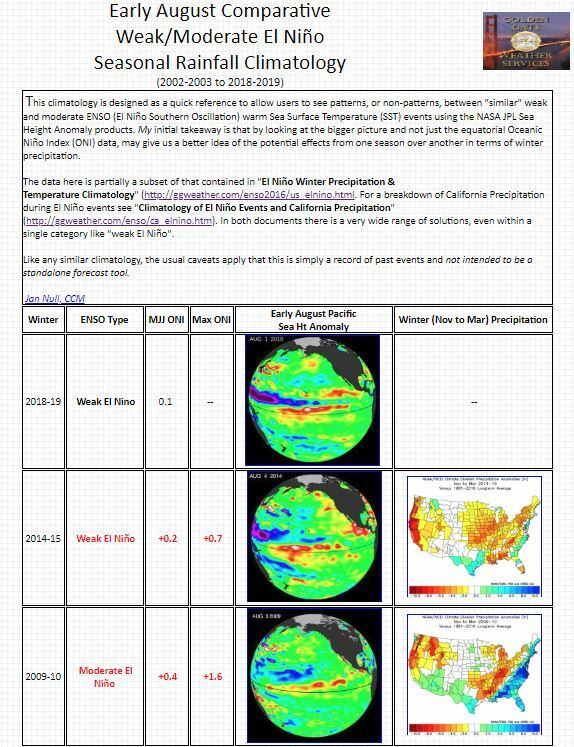 I have also updated several previous ENSO climatologies with regards to rainfall and temperatures. Jan Null has been a meteorologist in the San Francisco Bay Area for over four decades and is frequently seen on television and heard on the radio when weather is in the news. Twenty years ago he founded a consulting firm, Golden Gate Weather Services, after a 24 year career with the National Weather Service. Mr. Null is a Bay Area native, having grown up in Oakland and lived in the East Bay until 2006 when he moved to Saratoga. He received a Bachelor of Science degree in Atmospheric Science from UC Davis in 1974 and his Master’s from San Jose State in 1992. Jan joined the National Weather Service in 1974 at the Weather Service Forecast Office in Redwood City. He worked as an operational forecaster throughout his career, including 13 years as Lead Forecaster. During his tenure at the NWS he also served as Meteorologist-in-Charge at the Center Weather Service Unit at the FAA’s Air Traffic Control Center in Fremont. He also did extensive research into the relationship between El Niño, La Niña and California rainfall and throughout his career he was a frequent media spokesperson for the agency. Jan has also been an Adjunct Professor and Lecturer at San Francisco and San Jose State Universities where he taught one evening a week for nearly 30 years. In 1998, Jan founded Golden Gate Weather Services, a consulting firm that specializes in forensic meteorology. He frequently serves as an expert witness in litigation where the weather is a factor. This often involves reconstructing past weather events or as his wife refers to it: “CSI Weather”. Mr. Null is also an internationally recognized expert of the sad topic of the heatstroke deaths of children in vehicles. After the death of a child left a vehicle in San Jose in 2001 he did a comprehensive study of vehicle temperatures that was ultimately published in Pediatrics in 2005. Since that time he has spoken at numerous national conferences and worked with a wide variety of child safety advocacy groups and agencies to raise awareness about the dozens of children who die from hyperthermia in hot vehicles each year. This data continues to be updated at NOHeatstroke.org. In his spare time he is a serious amateur photographer, specializing in wildlife and landscapes. Jan is married to Susan Hollis, a lifelong Saratoga resident and Realtor. He has two adult children in the Bay Area and the world’s most adorable 9-year old granddaughter and 4-year grandson.